Woolacotts has been awarded highly commended at the ‘Freefall Experience Design Ideas Competition’. Run by Engineers Australia, the competition was launched in 2013 during Canberra’s centenary celebrations. It invited Australian engineers and other creative professionals to design a showcase installation in the Freefall forest at the National Arboretum to be enjoyed by visitors for decades to come. Entries had to celebrate engineering innovation and excellence. The National Arboretum Canberra occupies a magnificent site within the central national area of Canberra with sweeping vistas across Lake Burley Griffin to the city and to the parliamentary areas of the National Capital. More than thirty entries were received to the competition representing every Australian state. The jury was impressed by the quality of the proposals, the range of creative responses, and the imaginative presentations. Mr Rolfe Hartley, former national President of Engineers Australia and Chairman of the Honorary Competition Jury announced the results at an event at the National Arboretum Canberra on 1 August 2014. Together with architect Mark Szczerbicki, the Woolacotts entry was the ‘Kinetic Canopy Lookout’. 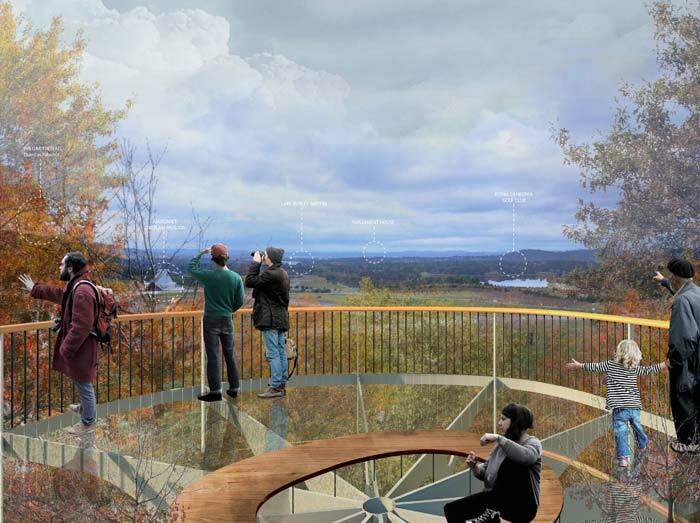 The concept is an elegant, organic-shaped elevating glass platform that would allow visitors of all ages and abilities to gain a spectacular view of the surrounding Arboretum. 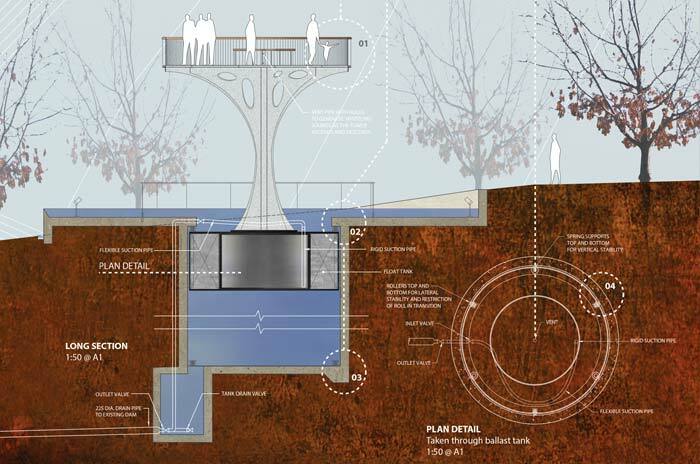 The real magic behind the canopy is how the platform is raised and lowered – using the power of water. To move the tower up or down, a gravity/syphonic drainage system would adjust the amount of water in a central ballast tank. Submarines use this principle of adjusting the volume to water in a ballast tank to dive or surface. The system would require no power – making it both a sustainability and engineering feature to delight both adults and children. The ascent and descent would have the feel of a hot air balloon, which along with the glass floor would add to the thrill of the experience. The architectural design celebrates the surrounding environment, its shape drawing on the leaves of the Pin Oak trees that surround the site. “With 33 entries received from around Australia, I am thrilled we were one of only two highly commended entries,” said Woolacotts Principal Engineer & Operations Director, Stephen Branch. An exciting engineering solution that embraces form, scale and technology to create a very special visitor experience – an organic viewing platform that rises from the forest floor using hydraulic principles, lifting the visitor up to view the forest and arboretum. As a strong object in the forest, the proposal celebrates the story and potential of engineering. Finally, the jury commended “the vitality and quality of the design idea”. Find out more about the Freefall Experience at www.freefallexperience.com.au. Woolacotts has a long history of delivering innovative projects that enhance local communities. If you would like to find out more about our community infrastructure story, please contact our sector leader, Clare Woods.